We know that one solution doesn’t fit all. That’s why we offer a variety of services to match your situation. What is a health flexible spending arrangement? A Health Flexible Spending Arrangement allows an employee to pay for qualified medical, dental, and vision expenses with pre-tax dollars. The benefit of paying for your expenses before taxes, is that it will reduce your taxable income. Therefore, you pay less federal, state, medicare and social security taxes, which in turn increases the employees take home pay. This type of an account has gained with popularity over the past several years, as health care costs continue to escalate and the need for medical savings becomes a necessity. The tax savings alone makes this an attractive employee/employer benefit, if you are willing to jump through a few simple IRS hoops to get it. What are these simple hoops? With these plans regulated by the IRS, they require that an irrevocable annual election be made prior to the beginning of the employer’s Plan year. This election can be changed, but only if the employee has a qualifying event (such as, a birth of a new born, adoption, marriage, or divorce). Once the election is made the employer will withhold these contributions based on the employees pay schedule, generally over 12 months. The attractive benefit about the Health Flexible Spending Account is that it is a pre-fund account to where the employee has full access to their annual election from the first day of the Plan year. Annual election must be used by the end of the Plan year to avoid forfeiture. Most employees are paying for out-of-pocket medical, dental and vision expenses right now with after-tax dollars and losing this tax benefit. 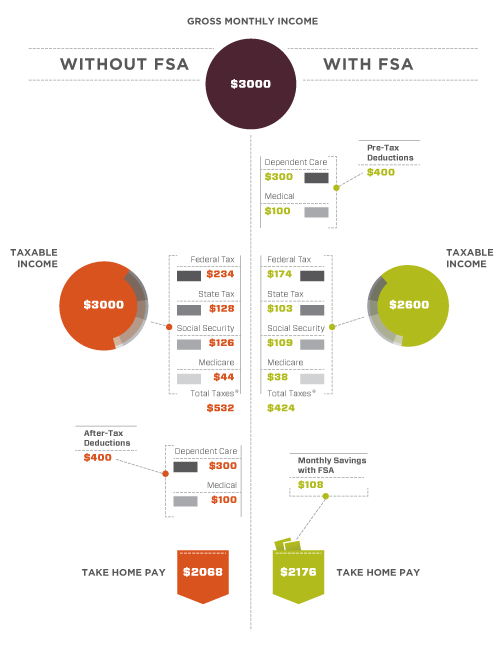 So take a quick look at how flexible spending accounts can save you tax dollars and help you save for the future! How will a flexible spending arrangement save you money? Health FSAs allow individuals to pay for out-of-pocket expenses, not covered by their insurance companies or other types of arrangements through their prefunded tax free account. Some common qualified expenses are insurance copays, deductibles, prescriptions, orthodontia, and eye glasses. Take a look at the Publication 502 for qualifying expenses, excluding those expenses for cosmetic surgery, insurance premiums, and long term care. In order to offer flexible spending accounts to employees with pre-tax deductions, an employer must have a Cafeteria Plan which includes provisions for this type of account. Once the Plan is in place, employees can determine and estimate their annual expenses based on the employers Plan year and annual limit. It is advised that employee’s underestimate their expense slightly to avoid forfeiting any unused funds at the end of the Plan year. Most employers, offer a grace period extension which will provide an employee an additional 2 ½ months to incur expenses after the end of the plan year. Forfeiture of account funds are very rare, since most employees underestimate their account elections and AxisPlus Benefits™ provides guidance to utilize accounts efficiently. So why pay for these same expenses with after-tax dollars? Enroll today and start putting more cash in your pocket and start receiving the tax benefit you deserve! This website and its content is copyright of AxisPlus Benefits - © AxisPlus Benefits 2019. All rights reserved.